This helps readers better understand Dalferth’s claim that, “Christian faith stands or falls with the confession that Jesus has been raised by God,” and that the task of theology consists in the thoughtful exploration of the implications of this confession (p.31). He sketches out a vision of what this kind of theology might look like, noting that it would include “interpreting the resurrection with the cross in mind, the cross with God in mind, God with the message of Jesus in mind, and God’s actions on the cross and in the resurrection of Jesus with us and our world in mind,” resulting in a solid inner rationality for the structure of the three major fields of Christology, the doctrine of God, and pneumatology (pp. 31-32). For Dalferth, this theological process involves three fundamental steps. First, it means asking, “What does it mean for Jesus, and therefore for a correct understanding of Jesus, that God raised him from the dead?” (p.32). Post-Easter inquiry into the meaning of Christ’s death and resurrection leads to the traditional doctrine of the incarnation, which Dalferth does affirm. The classical Christian doctrines of Jesus as vere homo and vere deus (true man and true God), of creation and sin, and of God as creator, justifier, and bringer of salvation each unpack the whole of the basic Christian resurrection confession from different vantage points. Secondly, one must explore how the cross and resurrection of Christ sheds light on and God’s nature and identity. For Dalferth, God’s activity on the cross and resurrection are best understood as creative divine action, the basis of which must be described as love. The God who acts in this way can only be properly understood as trinitarian. Dalferth puts it like this, “Christians cannot state who is meant by ‘God’ without identifying him as the one whom Jesus called his father and our father” (p.33). Furthermore, the Holy Spirit is integral since nobody can say with certainty that it was right for Jesus to speak of God in this manner “unless he or she has been assured of this by the Spirit of God” (p.33). It can be unambiguously affirmed that Jesus’ saving death can be understood using the theological category of atoning sacrifice. “There is no question but that it is possible to understand Jesus’s saving death as a sacrificial death. After all, we have seen that the whole of the New Testament is steeped in the imaginative world of sacrifice” (p.292). Dalferth seems to inhabit a middle ground between the ways of thinking exemplified by scholars like Rudolf Bultmann who have dismissed the category of atoning sacrifice as being untenable in this day and age as well as thinkers on the other side of the debate, like Tübingen scholar Hartmut Gese, who insists that the saving significance of Christ’s death can only properly be understood as an atoning sacrifice. Dalferth argues, “No interpretation of Jesus’s death can claim to be the sole authentic expression of salvation, not even one based on the theology of sacrifice” (p.292). Other interpretations of the atonement, such as the Christus victor model, must also be given their due place. Thought-provoking, if potentially contentious, words indeed. I found Dalferth’s treatment of the relationship between the confession of Christ as resurrected and incarnational Christology to be both the most interesting and challenging part of Crucified and Resurrected. Dalferth’s explanation of incarnational thinking as a way of interpreting the primary confession of Jesus Christ as resurrected gives readers a coherent way for understanding the place of this important tenant of orthodoxy within the structure of Christology itself. However, while I can understand his perspective on the logical priority of the resurrection confession, it seems to me that this line of reasoning may miss the mark if and when it goes on to also claim that therefore the resurrection and not the incarnation is the most important heart of the Christian faith. Within Christian theology, when and how can one really speak of the incarnation without also speaking of the resurrection, and vice versa? They seem to be (in this humble readers eyes) twin theological pillars that must both be held as immensely important, without one being necessarily judged as less central than the other. This should still be the case even when the confession of the resurrected Christ is treated as the logical starting point of dogmatic Christology. 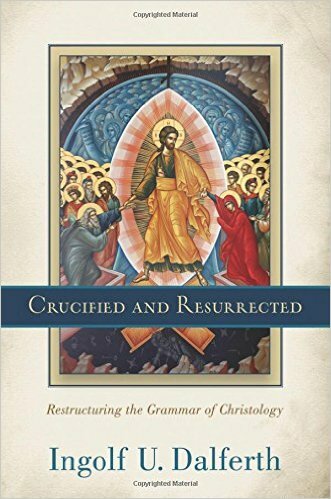 Crucified and Resurrected is a lovely, meticulously-argued, challenging work that resists simplistic pronouncements. One can only slowly work through it and leave notes in the margins. Readers will be fully rewarded for their efforts. This entry was posted in Book Reviews and tagged Book Reviews, Christology, Incarnation, Ingolf Dalferth, Resurrection by joecrow91. Bookmark the permalink.